I travel a lot and rent all kinds of cars. Today, the good folks at Budget Car Rental were nice enough to upgrade me to a Toyota 4Runner. That means it’s time for a vehicle specific article on how to mount a cell phone, tablet or GPS in a Toyota 4Rrunner. 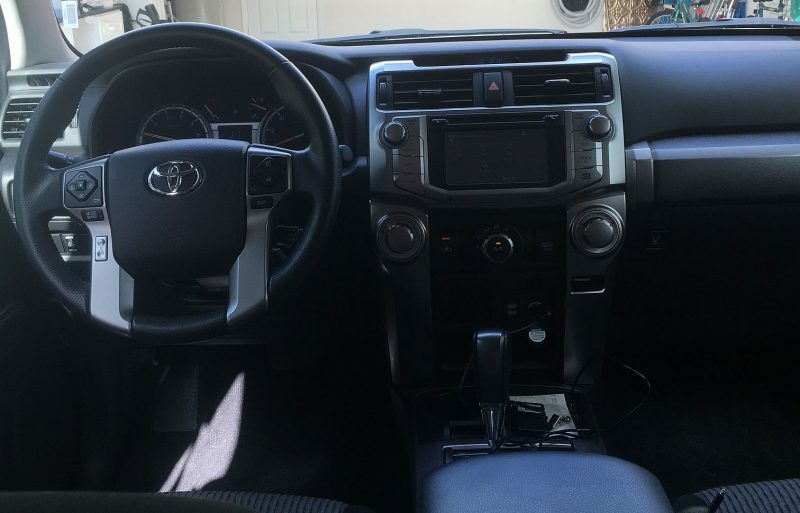 A photo of the interior of a Toyota 4Runner accompanies this article. It’s a fairly spacious interior with a bit of a further reach to the windshield. Nice flat dash but not overly deep which would limit use as a mounting location. Normal horizontal vents are present. The cup holder placement is a little different. The Toyota 4Runner also has a CD player which we can use to mount a device. So let’s see what’s going to work best. For a phone, the traditional windshield location best. While it’s a longer reach to the windshield, a basic smartphone holder with a suction cup seems to be your best bet. My recommendation for this location on a Toyota 4Runner will be the Arkon MegaGrip Suction Cup Windshield and Dash Mount. This suction mount features a vacuum locked suction assembly attached to a pivoting arm. The phone can swivel into any orientation. The mount also comes with an adhesive disk that you can stick to the dash to turn the mount into a console mount. The suction assembly can adhere to the adhesive disk just like it would on a windshield. This is a very reliable mount and I can vouch for it based upon my years of personal use. The same mount but for a Garmin GPS is the Arkon Windshield Dash Garmin Nuvi Suction Mount. I have recommended this one over the many years it has been available and have used it myself as well. It’s an excellent mount that comes with a 2-year warranty. It’s more rugged and longer than the Garmin mount you received in the box. Like the prior mount, this is a longer reach to the windshield so set it before the drive. A vent mount will work well. The vent to the middle left near the driver is the best location. Easy to see and simple to install on these Toyota 4Runner vents. The TechMatte MagGrip Magnetic Car Mount Holder for SmartPhones is an excellent choice. I have used these before. The mount has a magnetic surface a little larger than a US Quarter. The back has four prongs that are used to attach to a car vent. This design allows attachment to either a horizontal or vertical vent. The attachment to the vent slats is accomplished by aligning a vent slat between the prongs and pushing forward. There are included metal strips which attach to the back of your case or phone. That’s how it attaches to the mount. You can also use this for a GPS that has a flat back. A car seat bolt mount for the Toyota 4Runner is a no-go. The seat bolts are hidden by a plastic cover. While you can certainly use the option to bolt it directly to the floor board, most are not going to want to drill holes into their Toyota 4Runner floor. Let’s move on. The Toyota 4Runner has a decent sized dash which will work for a phone or GPS mount. A tablet will be too tall for a dash mount. You can use the two suction mounts I mentioned already as they both come with an adhesive disk to stick onto a flat dash surface. This option is best for states where mounting to a windshield is illegal. The Toyotoa 4Runner has a CD player. This is in a good spot to support a smartphone or GPS. It’s near eye level and presents the device at a good spot to use it as a GPS. A good option is the Mpow CD Slot Mount for SmartPhones. Be sure to follow the included instructions for a secure fit. The included cradle opens to 3.4 inches and swivels into any orientation. Remove the cradle to expose a 17mm ball suitable for a Garmin GPS. Cup holders on a Toyota 4Runner are located quite low and close to the floor. One cup holder is forward near the control panel and the other is set back near the arm rest. Neither makes great locations for mounting a device. Unfortunately, the rear cup holder is the only place you can put a tablet, but I’m not a fan of the location. Consider the iKross Tablet and Cell Phone Cup Holder Mount. There are a few nice advantages with this mount. It comes with two cradles. One to fit your tablet and a smaller cradle to fit your phone. The tablet mount expands from 7 to 10.2 inches. If a case or skin is present then you will use the arms on the shorter dimension (landscape). The cradle can swivel 360 degrees into either orientation. The mount has a 10-inch arm that can be adjusted at the base and tip. These fit cup holders to 3.75 inches. This location is not recommended for app that require access while driving. So it’s fairly easy to find a good mounting spot for a smartphone or GPS on a Toyota 4Runner. Tablets are a real challenge. Many traditional locations such as the vent, windshield or dash will work well for your phone or GPS. The CD Player is another good spot. Not a fan of the cup holder locations and the seat bolt is completely out.